Potatoes are a staple of many meals, and as such are one of the most prolifically grown of foods. In many ways they are a perfect food - amazingly versatile and in the right conditions can be stored for months. Consider what you can do with a humble potato - chip it, mash it, fry it, roast it, sauté it, boil it and bake it. You can also make tasty snacks like crisps and fries with potatoes, as well as using them to form the backbone of good rustic homemade food such as stews and soups. Whilst potatoes are still relatively inexpensive to buy, you can still grow your own at home cheaply. Shop-bought potatoes will never match the taste of freshly dug potatoes straight from your own garden or allotment! Potatoes are relatively easy to grow, and although they need a good depth to crop, there are a multitude of space-saving solutions for all garden sizes. If you leave your shop bought potatoes long enough, they can start sprouting. You may be tempted to plant these potatoes, but bear in mind that they may have been sprayed with a multitude of different pesticides. You also have no way of verifying whether they carry any diseases that could ruin your potato crops. It's best to opt for an early variety (first early or second early are fine) of potato, as they tend to be more successful than main crop potatoes. 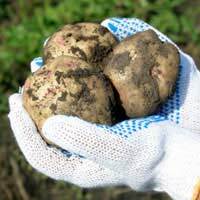 There are many early potato varieties to choose from, including Charlotte, International Kidney, Pink Fir Apple, Orla, Maris Bard, Pentland Javelin, Arran Pilot, and Kestrel. If you have limited space and wish to grow potatoes, you can opt for purpose-built potato planters. Although you can buy ready-made potato planters, they do tend to cost a fair amount. However there are many ways to build your own potato planters, using either cheap or recycled materials. One popular way to create a potato planter is using old car tyres. These can be picked up (usually free of charge) from tyre specialist garages. You will need around three or four tyres of the same size, stacked on top of one another. The 'hole' inside can then be filled with a layer of broken crocks, broken polystyrene or gravel before adding good quality compost, ready for planting. Some supermarkets will willingly give away stacks of old flower buckets. Sometimes you will have to pay a small charge - around 99p - or make a charitable donation, but in comparison to the cost of a 'proper' potato planter, this is a steal! The flower buckets will need holes drilled into the bottom to allow for drainage. But once they are filled with compost you will be able to plant one or two seed potatoes in each bucket. Once the potatoes have matured enough to harvest, you can simply tip the bucket up and get to the potatoes this way. Alternatively, you could use a trowel and dig around, but you may miss some of the new potatoes! The spent compost can then be integrated into your compost heap. Another source of cheap buckets is builder's merchants. The buckets are fairly large in size and very cheap - currently between £1 and £2 each. Again, each bucket will need holes drilled into the bottom to aid water drainage, and if you intend to grow a fair few potatoes, you should plant to buy one bucket per seed potato. To keep slugs away you could try putting some copper wire around the bucket rim. If you can get hold of spare wood - from local recycling schemes, timber merchant's offcut bins - then why not try making a wooden planter. To stop the wood rotting at soil level, the wooden planter can be placed onto recycled sunken bricks. The wood can also be lined on the inside with old compost bags and filled with soil ready for planting. Basically, as long as you have a container deep enough, almost anything can be used to plant your potatoes in. Plastic storage tubs, dustbins, old juice barrels are just some other innovative ideas for container potato planting.